Companion Animal Hospital Blog: Why do cats need dental exams? FORL of the canine tooth in the cat. 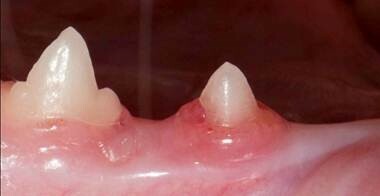 Feline Odontoclastic Resorptive Lesions (FORL’s) account for 20-75% of all dental disease in cats over 4 years old. Odontoclasts, which originate in the bone marrow, migrate and attach to the external surface of the tooth root (portion of the tooth within the tooth socket) and resorb (i.e. destroy) the root surface. These cells normally are responsible only for turning over the baby teeth in kittens to make way for the adult teeth. These cells remain active in later life for reasons we don’t understand. As time passes the root is completely destroyed, and the crown is left behind. In the end stage of the disease, the entire tooth is eaten away by the odontoclasts. FORL’s were once identified as “cavities”. We now know that this is not correct. Cavities are caused by bacteria, whereas, FORL’s are not. In fact, the real cause of FORL’s remains elusive and remains a topic of debate. Cats with FORL’s have the main clinical sign of “chattering” when eating. Another sign is that cats with FORL’s will have a tendency to drop their hard food or show a preference for soft food only. Patients with FORL’s salivate profusely indicating extreme pain. Your veterinarian will note a missing tooth, or a portion of the tooth crown missing. In areas where portions of the crown are missing, the gums in the area are usually observed to cover the missing area, and a red spot is noticed on the crown. Teeth with early FORL’s cannot be detected on gross examination. This is because the disease starts at the root beneath the gum line. These “normal” teeth can only be diagnosed with the use of dental radiographs at the time of a dental cleaning. FORL of a mandibular premolar in the cat. Only cats with end stage disease can be diagnosed with FORL’s due to the fact that the crown is missing. The remainder of cats with the disease need to have full mouth dental radiographs taken, to assess the root structure where the disease begins. This is as important as the dental cleaning itself. The recommended treatment for cats with this painful disease is to have the affected teeth extracted. Extraction or crown amputation with intentional root retention, are the only currently accepted methods of therapy. The latter is a procedure where the crown of the affected tooth is removed with a bur; leaving the resorbing roots buried in the bone to continue resorbing to completion. The crown amputation procedure alleviates the clinical signs of disease because the exposed and sensitive portion of the tooth is removed. This procedure however, is limited to affected teeth that have been appropriately radiographed and have severe tooth root resorption. Talk to your veterinarian today to schedule a dental cleaning treatment that includes full mouth dental radiographs to screen for this painful disease.